We've known for quite some time that the new Spider-Man, played by Tom Holland, will make his Marvel Cinematic Universe debut in Captain America: Civil War. But there were many who thought the studio wouldn't reveal this iconic character until the movie hits theaters on May 6. Thankfully, the second trailer for Captain America: Civil War arrived earlier today, giving us our first look at this new web-slinger in action. After the trailer debuted, filmmaker James Gunn, who is currently in production on Marvel's Guardians of the Galaxy Vol. 2, revealed on his Twitter page that he thinks this Spidey is hand down the best ever. "I think Tom Holland is the best Spidey/Peter Parker ever by a country mile. It's his own thing. He is to Spidey as (Robert) Downey (Jr.) is to Iron Man, (Heath) Ledger was to the Joker, (Chris) Pratt is to Star-Lord." Captain America: Civil War will pit teams led by Captain America and Iron Man against each other, and while the studio revealed who was on which side, it was never clear which team Spidey will be fighting alongside. Team Iron Man includes Tony Stark (Robert Downey Jr.), Black Widow (Scarlett Johansson), Vision (Paul Bettany), War Machine (Don Cheadle) and the new character T'challa (Chadwick Boseman), who will make his debut in this movie before starring in Black Panther, set for release on February 16, 2018. Team Cap includes Captain America (Chris Evans), The Falcon (Anthony Mackie), Scarlet Witch (Elizabeth Olsen), Hawkeye (Jeremy Renner) and The Winter Soldier (Sebastian Stan). The final shot of this trailer reveals that Spidey is fighting for Team Iron Man, when Tony Stark calls out "Underoos," and Spidey snags Cap's shield and restrains his wrists with web shooters, before we see his costume for the first time. Earlier this month, Tom Holland shared a new video that showed off off his aerial skills, as he practiced a number of different backflips. While Marvel and Sony haven't officially announced when production will begin on the new Spider-Man movie, the studio has already set a July 7, 2017 release date. Marisa Tomei is on board to play Aunt May, and we reported yesterday that actress/singer Zendaya Coleman has signed on for a mysterious role, though she's not believed to be Peter Parker's new girlfriend. It's been rumored that Sony is aiming for a diverse supporting cast to put around Tom Holland. 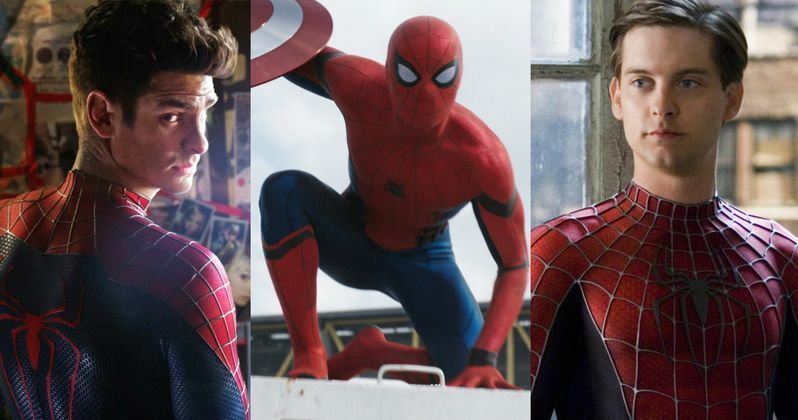 While we'll have to wait and see if Tom Holland is in fact the best Spidey ever, he will be the third actor to take over the role in the past 15 years. Tobey Maguire starred as the web slinger in director Sam Raimi's Spider-Man trilogy, with Andrew Garfield taking over as Peter in The Amazing Spider-Man and The Amazing Spider-Man 2. This new movie will be a bit different though, getting rid of the origin story and focusing on Peter trying to juggle his school work and his crime-fighting ways. Take a look at James Gunn's tweets below, and stay tuned for more on Spider-Man.